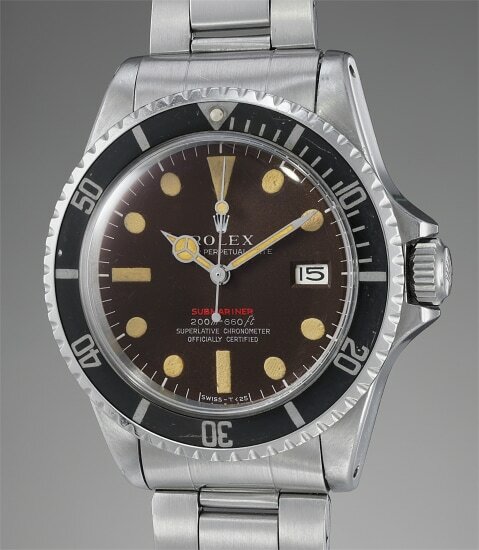 Clasp/Buckle: Stainless steel Rolex deployant clasp stamped "3 72"
In production from 1967 to 1979, reference 1680 features an interesting evolution: most notably, early examples such as this one were given a red “Submariner” designation on the dial, while later examples feature white graphics. Adding rarity and flair, Red Submariners (as opposed to their Sea-Dweller counterparts the “Double Red”) are today extremely sought-after. Even within the Red Submariner family of dials, one can notice an evolution of the graphics with 6 variations (Marks). The present early specimen features a Mark II dial, recognizable from the meter first arrangement of the depth rating, a feature shared by Mark I to Mark III dials. Mark II dials are furthermore defined by the very thin font used for the depth rating. Mark II (and also Mark III) dials can be found on examples from about 2.15M serial to 2.45M and it is estimated that less than 5% of the total 1680 made feature this dial. Adding to this remarkable rarity, the present watch features a dial which has tropicalized over time to an incredibly even and attractive milk chocolate tonality, making this piece a superlative gem from the already highly collectible Red Submariner family.